Build a Dream Playhouses Review & Giveaway CLOSED!! Kids love to play and being creative is very important! Children have amazing imaginations and it is always great when we, as parents, can help grow those imaginations. We can do so by giving our kids the tools that they can explore with and be creative with. So when I was given a Imagine Wagon courtesy of Build a Dream Playhouses to share with my kids and review for my readers, I knew that this awesome playhouse would be a great tool for helping my kids explore their imaginations with! 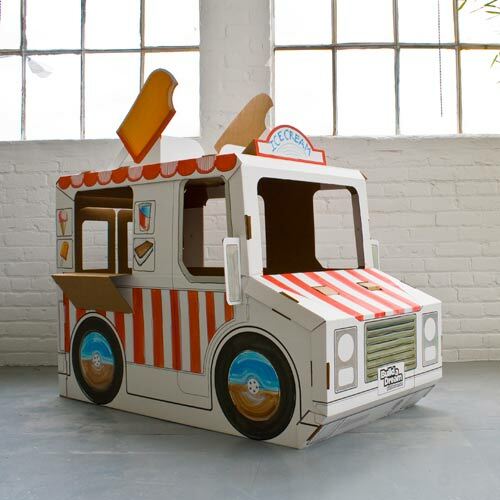 The awesome playhouses from Build a Dream Playhouses are safe and very affordable but on top of that they are also eco-friendly and they help encourage the endless imaginations of kids!! The playhouse kits that you get from Build a Dream Playhouses are easy to assemble, then once you have done your part in putting the playhouse for your kids together, there is a blank canvas for your kids to decorate and make the playhouses their own by painting, drawing and coloring what they want on their playhouse. My kids have made the Imagine Wagon into a traveling ice cream wagon. They have put their own touches on their playhouse and have made it their own. Since setting up, the Imagine Wagon has gone to the moon and sold ice cream to Buzz Light Year and Iron Man! My kids love the Imagine Wagon and thanks to the wonderful people over at Build a Dream Playhouses, your kids can too!! One of my amazing readers will win their own Imagine Wagon to share with the little adventurers in their lives!!! Like Build a Dream Playhouses on Facebook and tell them hi for me!! Then come back here and leave me your email with this entry!!! This giveaway is open to US residents. This giveaway will end at midnight on April 30,2011. Winner will be chosen at random.org and will be given 48 hours before another winner will be chosen. All products for reviews and giveaways are given as a sample from the companies. All opinions in reviews I conduct are my own. I was not paid to say anthing or review any products. I commented on the Build a Dream facebook wall. Nice One ! !I am agree that kids love to play very much and its necessary for kids to be creative and imaginative. It will be very good if we will ask our kids about their imaginations and their dream toys. Like Build a Dream Playhouses on Facebook and told them hi for you.